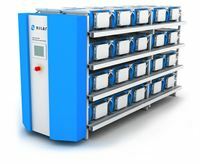 Nilar will exhibit at the leading battery trade fair showcasing Nilars´s latest energy storage rack solution, which is produced from battery cell to functional system in Sweden. For more information you can visit Nilar´s stand 322 and you will get an interesting conversation about the latest within energy storage technology and sustainable energy. The Battery Show is the leading advanced battery trade fair showcasing manufacturing solutions along the supply chain, including battery materials, manufacturing, equipment, components, testing and recycling, across a range of industries including automotive, electronics, power tools, utilities, telecommunications and defence. Nilar is the leading provider of energy storage solution for today’s infrastructure. The unique bi-polar construction of the battery pack provides reliable storage and a stable power supply from a lighter, safer and greener unit. Furthermore, the modular design allows packs to be coupled in parallel and series to deliver the power and capacity required to meet the needs of smart grid, telecom base stations, home solutions and other applications.